I do not know about you , but sometimes I am amazed at my thought process. For instance, Paula Deen came to mind (I don’t know why), then that led to thinking of her chicken pot pie with the puff pastry crust – Yum. Then my thoughts went from the chicken pot pie (because I cannot have puff pastry anymore – Sad) to making the filling into a soup – Happy again. I know it is roundabout thinking , but sometimes that is how I get some of my best ideas. In a large dutch oven melt butter and slowly add flour. Stir until consistency is of paste, but do not brown. Slowly add coconut cream and cashew milk; stir. 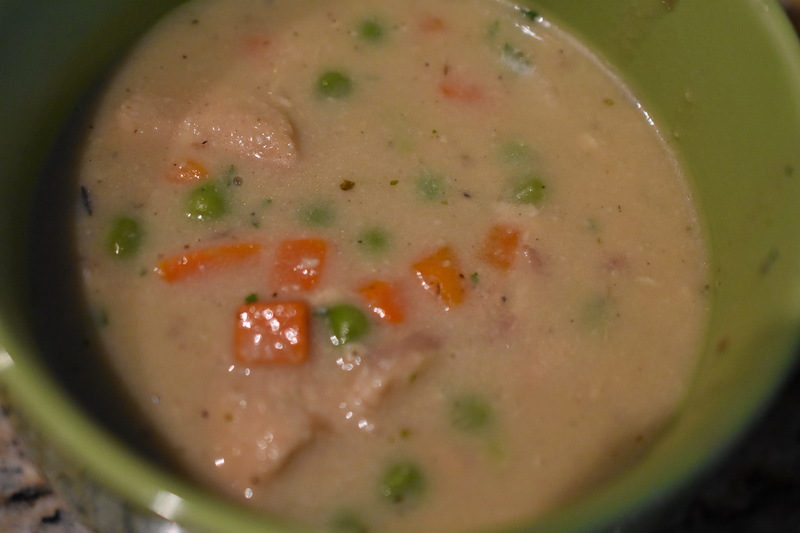 Add chicken base, garlic, onion, peas and carrots blend, chicken and nutmeg. Taste and season as needed with all-purpose seasoning. Stir occasionally, until simmering. Add chopped parsley Stir. Serve. Eat. Enjoy. Note: This soup would be great served with biscuits. At least that is what my husband says. It really is. Had enough leftover to freeze for future meal. Thank you. It is so tasty and comforting. Thank you. A very family friendly soup. Plenty leftover for a future meal.